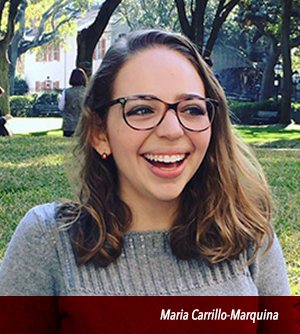 For Maria Carrillo-Marquina, one of the most appealing aspects of studying arts management at the College of Charleston is the broad scope of courses that this program offers. "Requiring students to take a range of classes that include accounting, grant-writing, fundraising, and arts finance," she says, "encourages us to think holistically about this field. And, the program’s inherent flexibility also enables students to combine this major with other majors or minors in order to tailor your studies so that they align well with your interests." Maria says she also chose the College and its arts management program due to Charleston's vibrant arts community. Maria has taken full advantage of those opportunities by serving internships at Charleston's Gibbes Museum of Art and at the Halsey Insitute of Contemporary Art right on campus. Both of those experiences prepared her for a paid summer internship at the Whitney Museum of Art in New York City. Interested in arts management and want real-world education in the field? Check out our program. Ours is one of the few arts management programs in the Southeast for undergraduates, and the only one in South Carolina offering a major and minor. the program is uniquely situated in a vibrant city with a flourishing arts community. students have numerous opportunities for internships, career networking, independent studies and special projects. in addition, our faculty members all have strong professional connections and broad experience – both regionally and nationally – within the arts. ❱❱ Local artists, administrators and managers augment our course offerings. for instance, “Introduction to the Music Industry” is taught by Grammy award-winning musician Mark Bryan of Hootie and the Blowfish.